This is my first time using the E-liquid and I am very pleased with this flavor. 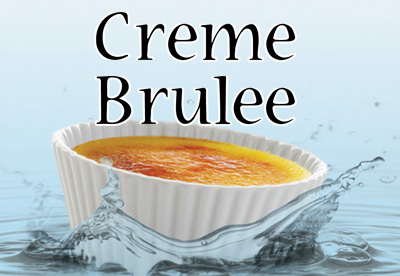 They aren't kidding, it really tastes like Creme Brulee!!! It is not overpowering and I never get sick of this taste. I highly recommend this flavor for new and avid vap users. If you are on the fence on this just buy it! You won't regret it. I've never really tried a real creme brulee before, at least not that I remember, so I'm probably not the best on judging whether the taste was authentic or not. However, I will do my best to describe what I tasted. I did expect more of a creamy taste, which I did not get, but my brother did taste a buttery taste. Our taste buds are different, so might yours. Smell: Sweet with lemon. Inhale: Nothing much. Exhale: Sweet with lemon taste. Vapor: Good. Throat hit: Capable of being strong, just depends on your setup.